In 2014, Stone released a beer from their famed collaboration series which was a take on the "Mexican Hot Chocolate Stout" that a lot of breweries have been trying over the past couple of years. The beer was "Xocoveza": a milk stout infused with chocolate, coffee, cinnamon, nutmeg, and chili pepper. It seemed to receive mostly universal acclaim and was seen as one of the best of its style. Naturally Stone wanted to take it to another level, so they took Xocoveza and subjected it to their barrel program (The "Quingenti Millilire" program). Stone released two variants on Xocoveza and I have in my possession the bourbon barrel-aged version (the other being a tequila/red wine version) known as Xocoveza Charred which was aged for seven months in Kentucky Bourbon barrels. This was a brewery-only release, so a big thanks to Rick for doing a trade with me for this one. Pours pitch black with ruby red on the edges. Practically no head, maybe a quarter of a finger which was tan. It looks like flat coke. Cinnamon, pepper skin, and nutmeg come first on the aroma. Then there's a slight lactose strain and nothing much else as I don't get bourbon, but there is some oak and char from the barrel. The taste has much more vanilla, especially right at the front of my tongue. Some more of that pepper skin and heat from said peppers is all over the inside of my mouth. Bourbon is much more noticeable here, but it is still underwhelming and might be the 4th or 5th strongest flavor in this beer. A little bit of lactose emerges on the finish as does a little bit of nutmeg. Overall, the flavors are pretty bland and nothing stands out. Seven months in a bourbon barrel? I have my doubts. Mouthfeel is a little light, but it is a milk stout, so it is understandable. Surprisingly this finishes clean, but maybe a little too clean, which is disappointing considering this is a BA stout with so many spices.There is a slight warmth and a miniscule alcohol taste which is a bummer for a 8.90% stout. No carbonation is to be found at all. 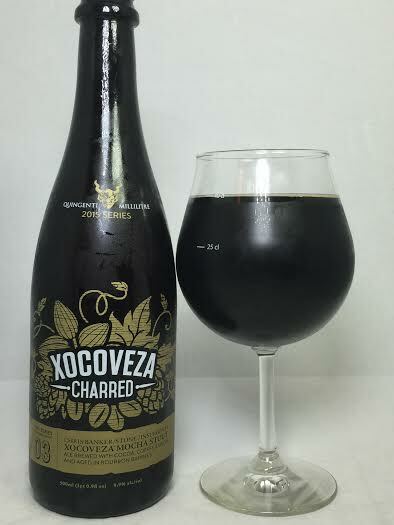 Maybe the base beer allowed the flavors to shine better before being mellowed out by barrel-aging because I can't help but be let down by Xocoveza Charred. I really don't think the barrel brought anything to the table on this one. If anything it took away from all of the spices, vanilla, and chocolate that people raved about a year ago. It's not a repulsive beer to drink, it's just meh.